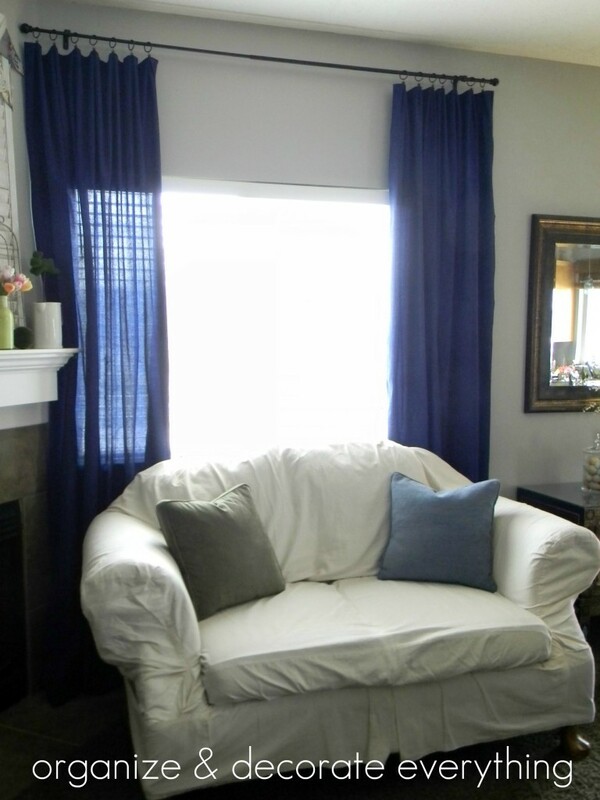 Curtains are a great way to add color, texture and design to a room. They can also make a window seem larger and the ceiling feel taller depending on where they are placed. I’ve been hunting for new curtains for 10 months, with no luck. My living room window is small and not centered on the wall, I wanted to add curtains to make the window feel larger and seem centered. I can’t believe what a huge difference it made. 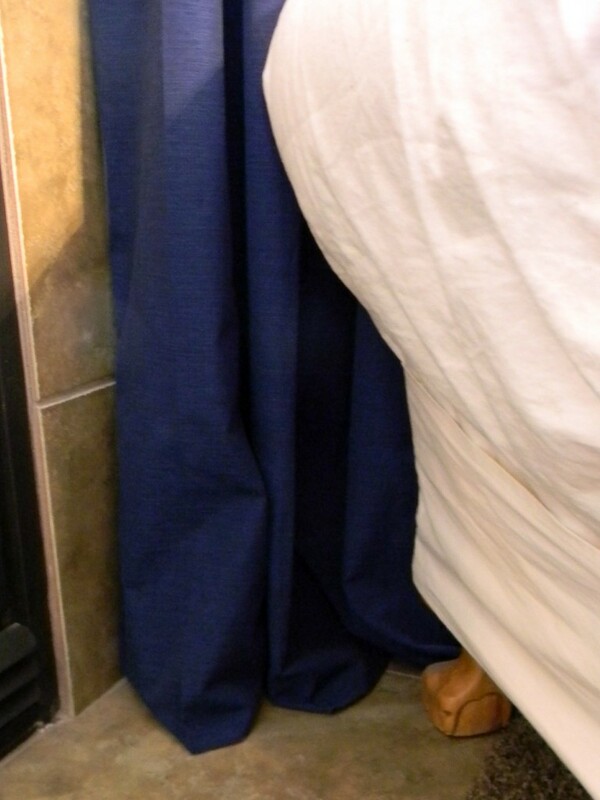 Table Cloth Curtains were an inexpensive and easy answer to my problem. Because I have 9 feet ceilings, all the curtains I wanted were way too expensive. 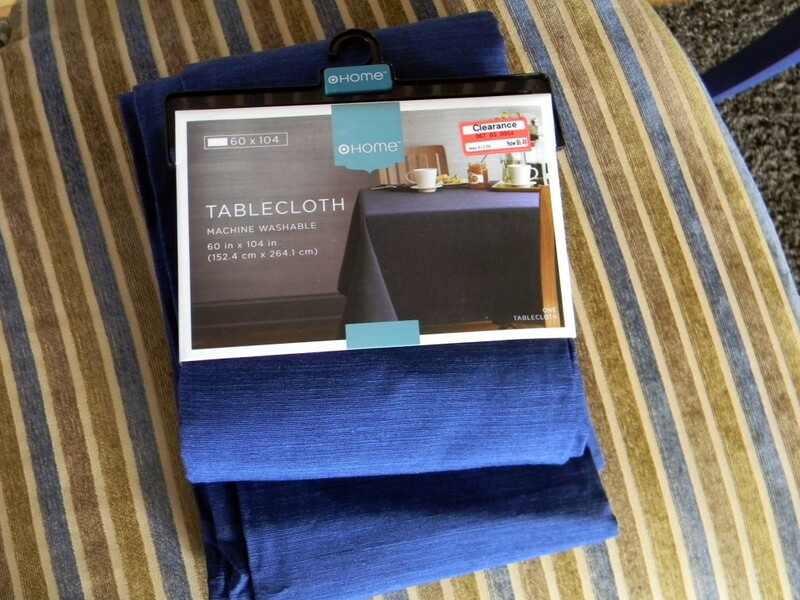 Then I found these tablecloths at Target on clearance for only $6.48 each. $12.96 for curtains! What a deal! The color is pretty fabulous too. I bought curtain clips at Ross for only $3. You know how I have this weird aversion to measuring anything (maybe that explains why my girls have such a hard time with math). I’ll show you how you don’t have to measure between the clips. 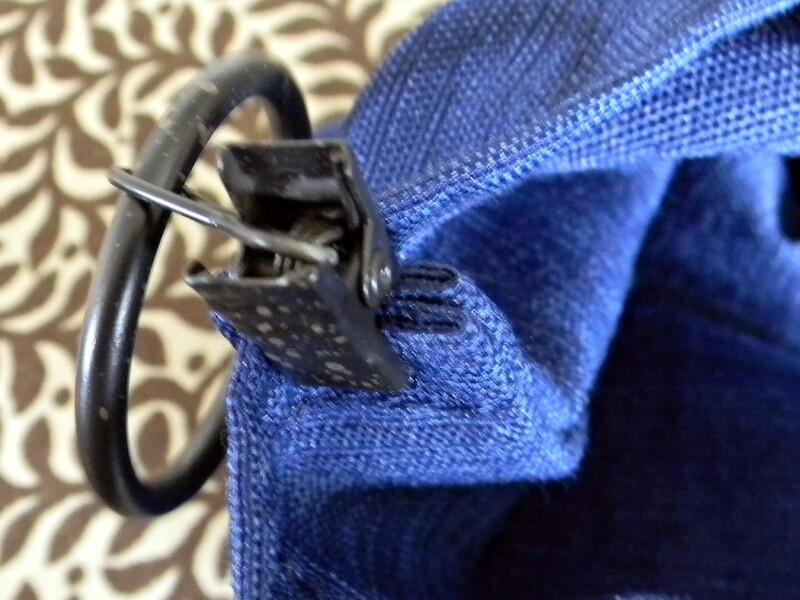 First I clipped the rings about 1 1/2″ from each end, then I folded the curtain in half and clipped in the middle. That left 4 rings so I folded each half of the curtain in thirds to find the placement of the 2 clips on each half. Super fast and easy and no measuring. 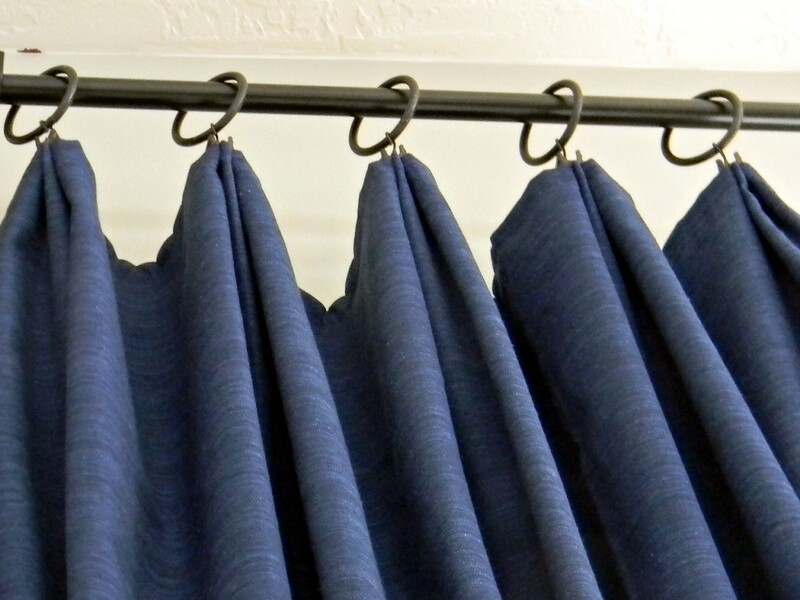 I made simple pleats in the curtain by making 2 folds and clipping them together on the back of the curtain. 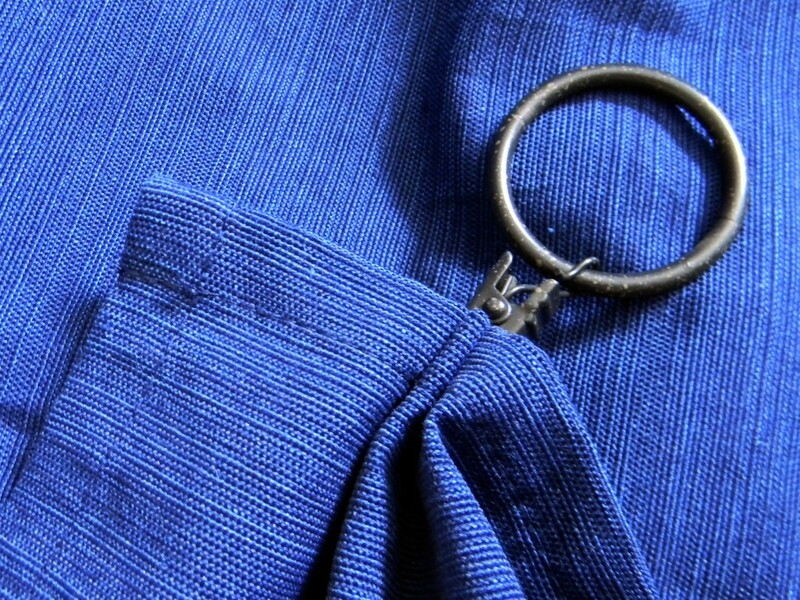 Which made the front pleats look like the photo below. I love how it turned out. I like how they puddle on the floor just a tad too. I was deciding between the blue or green table cloths but decided on the blue because of this little table on the other side of the room and the side chair with the blue stripes. Another great thing about the table cloths is that I didn’t have to alter them in any way to use them as curtains. I just ironed, clipped and hung them. And they make the window look so much larger. If you’re looking for an inexpensive alternative to regular curtains you should take a look at table cloths. 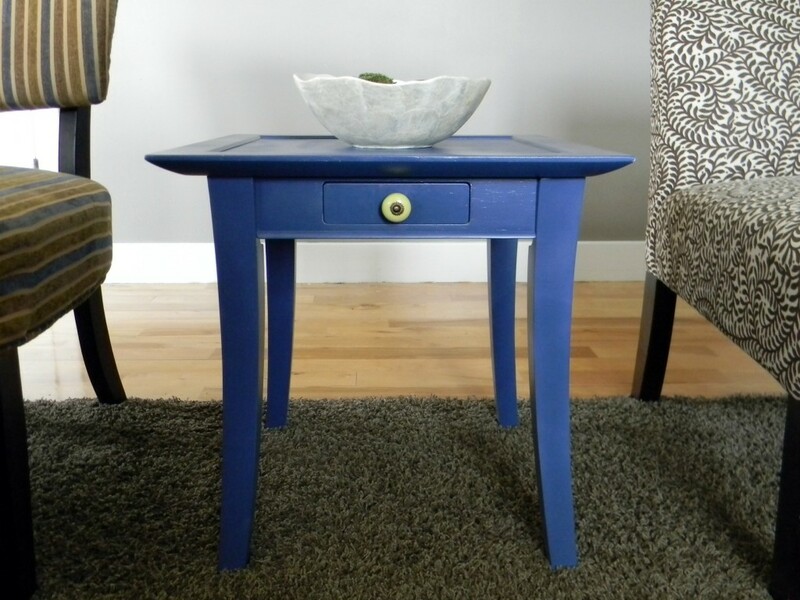 You might be pleasantly surprised of your style and color options. The curtains turned out perfect. I also have 9 plus foot ceilings and have been considering a similar approach . There are some very nice table cloths at World Market. I really like how you made the pleats, I hadn’t thought of that! Have a great day! Great way to think outside of the package (: I so love Tarjay – I troll the clearance items regularly. You never know what treasure you will find and their stuff is pretty decent quality. And since you didn’t alter these, you could always use them as tablecloths, too! I positively love what you’ve done and will be looking around Target for something that may work for our living room too. We’ve never been able to afford full length curtains for the living room. In my imagination, I see brown velvet or brown floral for wintertime, but….thanks for sharing how you made the pleats too. I’m inspired! I love how your curtains turned out! Very inspiring – affordable tablecloths! Love the pleats too. I did the opposite — I was looking for a black tablecloth and couldn’t find one. I saw a single black curtain panel in the Target clearance aisle. I got a faux-linen tablecloth for $4.00! Machine wash and dry and looks great always. This is my kind of project. Love the color, the simplicity, and your whole room. Great idea, done really well. I did this in my bedroom but I didn’t put the pleats in it. 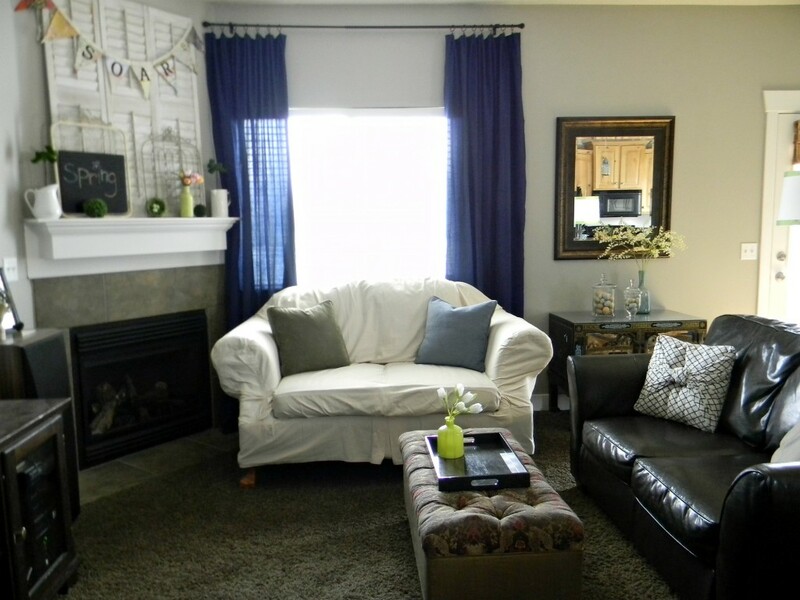 This is a very cheap way to put curtains in a room and they look great. Thanks for sharing they look like expensive drapes. Great idea! I can’ never find the “perfect” curtains, either. I love how yours turned out. Beautiful picture frame. I sure hope you’re able to fix it back up! Great idea! I’ve used sheets for curtains but hadn’t thought to use table cloths. Love how yours turned out. What a clever idea. I’ve looked at table cloths wished I could find curtains in the same fabric. But making the table cloths into curtains never really occurred to me. Looks great! Sometimes IKEA only carries things in their stores and not on line. I had that same problem before we got a store closer to us. I’m sorry. I have done this too…but I used towels for curtains in my bathrooms! Turned out fabulous and super cheap, which we ALL love 🙂 Never thought of table cloths for other areas of the home…Thanks! !